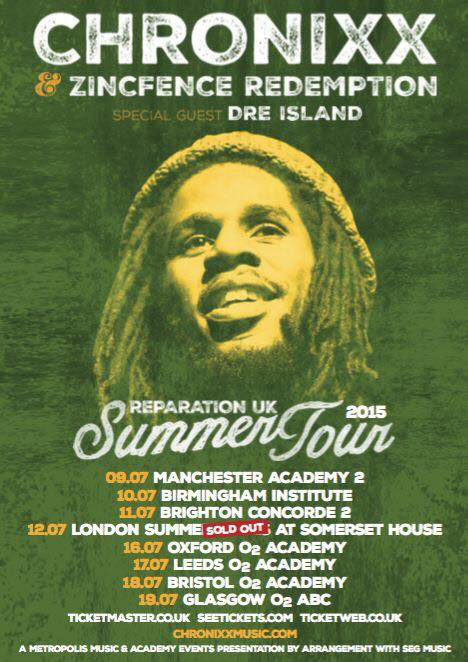 Chronixx is back in the UK for the third time, on a tour that takes in some very special places. Last weekend he and Zinc Fence Redemption band were respectfully received at the folkloric Glastonbury festival. Next they bring their Jamaican sub genre spanning show to Manchester, Birmingham, Brighton, Oxford, Leeds, Bristol, Glasgow and - in a significant move given the title of the tour - the open air Elizabethan courtyard of London's Somerset House. You can expect a comprehensive mix of roots reggae with uncompromising messages, sweet balladry, uptempo conscious dancehall and foundation touches (at Glastonbury Spirulina was switched onto the classic Joyride riddim). Support comes from Dre Island. Click here to check out the full list of tour dates!